Sustainable Cobourg and Go Green Together present, the second in our 2015 Speaker Series, “What Will Climate Change Look Like In Our Area?“. Mark Peacock and Kestrel Wraggett from the Ganaraska Region Conservation Authority will describe what we can expect in our region as a result of the effects of climate change and what we can do to mitigate them. Saturday, April 18, 2:00 p.m. 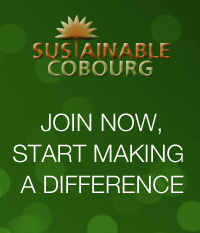 Following the presentation you are invited to attend Sustainable Cobourg’s Annual General Meeting. Information and memberships will be available. Board nominations and voting will take place as well. Only members are entitled to vote, so why not become a member! This entry was posted in Climate Change, Eco Action, Health, News 2015, Sustainable Planning and tagged climate change, Cobourg, environment, event, planning, sustainability. Bookmark the permalink.